This is the fifth release of Edradour’s limited peated line under the Ballechin name. I’ve previously reviewed #3 from port casks, and #4 from oloroso sherry casks. This is from marsala hogsheads, as per the back label which also informs us that only 6000 bottles were released. This was opened not too long ago for one of our local tastings and went down to the halfway mark right away. I’ve been drinking it fairly regularly since then (after reserving a reference sample) and have had a fairly up and down response to it. I initially took notes about three weeks after the bottle had been opened and didn’t like it as much as when it had just been opened–the palate seemed to have flattened. I thought this was odd and so waited on publishing the notes. Sure enough, that impression went away the next few times I tasted it. It may be that something changed in the bottle; more likely, something was off with my palate when I first took notes. I jettisoned those notes, and these are from later when the bottle was approaching the end. I should stress that from opening to finishing the bottle took only about 1.5 months. Nose: Rubber and something butyric. Not terribly promising at first. But those notes soon dissipate and then comes some farmy peat with sweet cereal and some gasoline. After that there are some brighter sweet notes–maybe a little bubble gummy; the dominant note though is the farmy peat. With time there’s an ashy note too. Much later there’s a mild creaminess and then the smoke gets somewhat sharp. Water makes the nose much brighter–there’s lemon now and more of a toffee sweetness too. Palate: A little watery and somewhat indistinct at first: the notes all seem to run together. Farmy peat and acidic smoke; some sweetness. With time it gets a little fruitier (hints of citrus and apricot along with some brighter berry sweetness). Water brings out a cereally sweetness and oddly, makes it feel less watery. There’s probably some interesting chemistry reason for that, but I slept through organic chemistry in the 11th and 12th grade. Finish: Medium-long. Fruity, ashy smoke–getting more acidic at the end. Comments: I’ve gone back and forth on this whisky since it was opened a month and a half ago. I think if I’d reviewed it right when the bottle was opened it might have scored in the mid-high 80s. Less than a month later, it would have been in the low 80s. Tonight it’s in between. At any rate, even at its best it’s pleasant enough, on the whole, but not something that demands your attention. 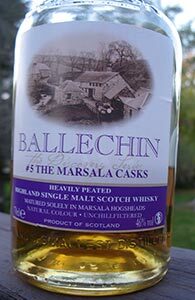 Has anyone had Ballechin 6 or 7? This entry was posted in -Whisky by Rating, 80-84 points, Edradour. Bookmark the permalink.